Posted on 26th November 2016 by Claire Austin Posted in Voodoo Dolls	. 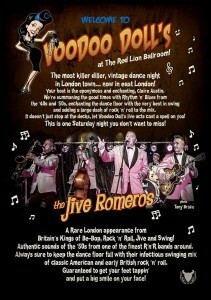 Don’t miss this rare London appearance by THE JIVE ROMEROS!! 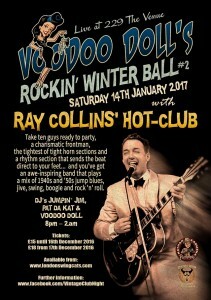 Then tickets will be available on the door from 8pm – just turn up!! All welcome – more the merrier! This is a gorgeous ballroom with huge dance floor so dust off your dance shoes and get your glad rags on! Just 2-3 mins walk from Leytonstone Station (Central Line & NIGHT TUBE!). Parking on nearby streets. 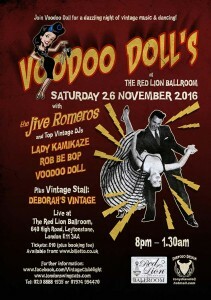 DJs LADY KAMIKAZE & ROB BE BOP will be on the decks, alongside your hostess VOODOO DOLL. Private Lessons / DJ for hire! Posted on 22nd November 2016 by Claire Austin Posted in Voodoo Dolls	. If you want a little extra help with your dancing, get some styling tips, improve your technique or just give it a kickstart if you’re new to this dancing lark, why not consider booking a private lesson?! One or two hour sessions available for singles or couples. Planning a party or special celebration for a small group of friends or family? Why not start the evening off with a swing dance lesson. The London Swing Cats are available – just drop us an email to discuss the details. Need a DJ for your party or event? 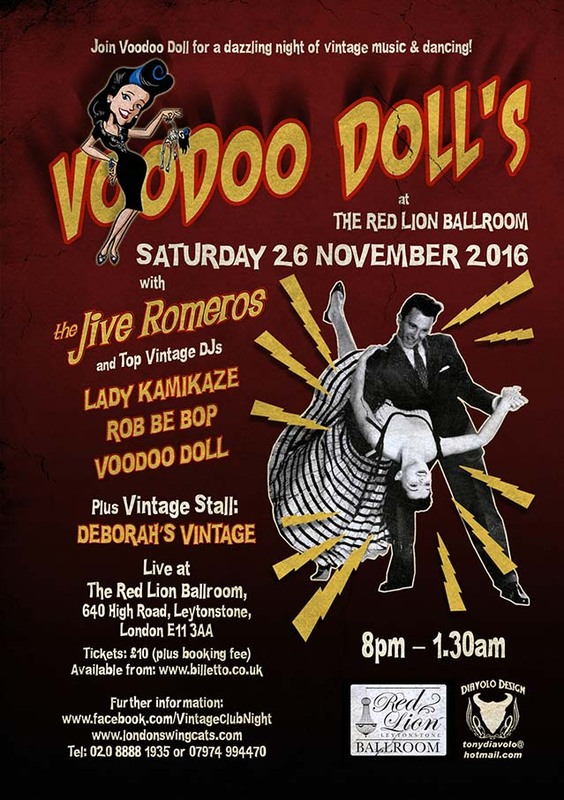 Voodoo Doll plays a mix of vintage music from the 20s through to the 50s and is happy to come along and make your event swing! 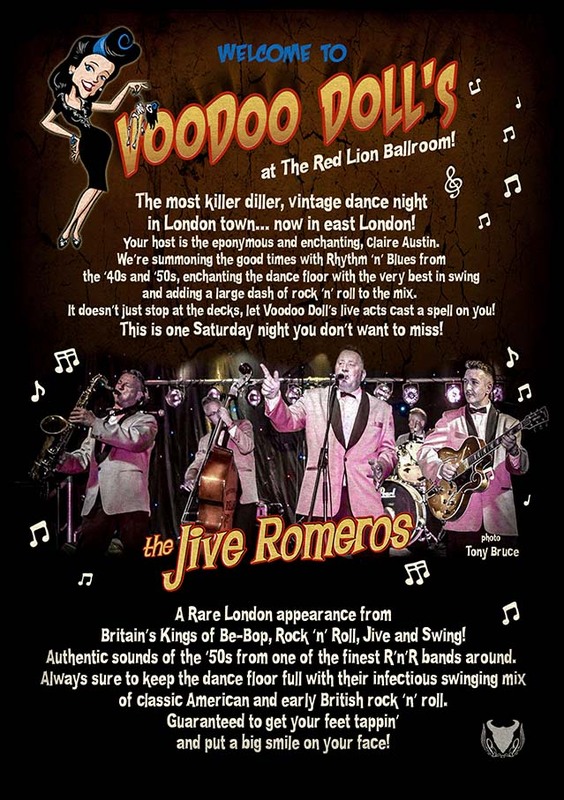 Voodoo Dolls at the Red Lion Ballroom… less than a week to go! Posted on 20th November 2016 by Claire Austin Posted in Voodoo Dolls	. Don’t forget to book your tickets online… only £10! Posted on 7th November 2016 by Claire Austin Posted in Voodoo Dolls	. 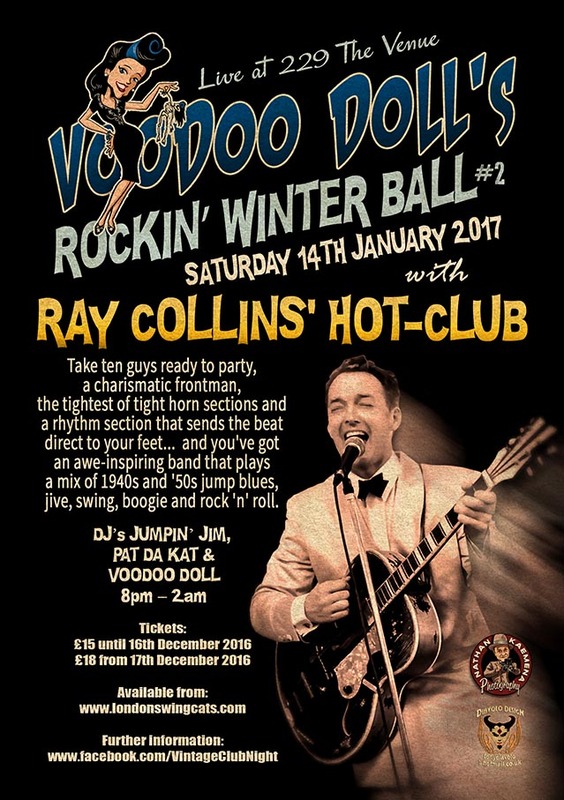 Join Voodoo Doll for her second Rockin’ Winter Ball, this time at the fantastic 229 The Venue in central London with everyone’s favourite swinging band. These killer musicians with their honkin’ horns, swinging rhythms and blistering boogie are a powerhouse that will simply rock your socks off!